Irritated by the disturbing static dusts on your record? Want to be free from the problem? Did you know the fact? Only Analog Relax anti-static brush can remove static electricity and dusts at the same time together. Ultra-fine static elimination fiber with 0.03mm in diameter, special material used for an audio product for the first time in the world, comes in the record groove removing static and dust all together. You will be liberated from the frustration of static dusts with this revolutionary record brush. This brush makes all the record lovers happy. If you do not know how to purchase, please contact us. this e-mail address. Please describe the items you want to purchase, the address, the phone number. Did you know that a record could collect 3,000~20,000V static electricity on its surface when it is taken out of the sleeve? The move of just taking out of the sleeve could generate such amount of static. This is because of the friction between the disc and the inner sleeve when they are pulled apart. The static electricity collects all the dust floating around you to your disc surface. The dusts attached to the disc are real pain. If you wipe them off, they just come back on the record immediately. Why? Because of the static electricity. You cannot be free from the dust unless you are free from the static. 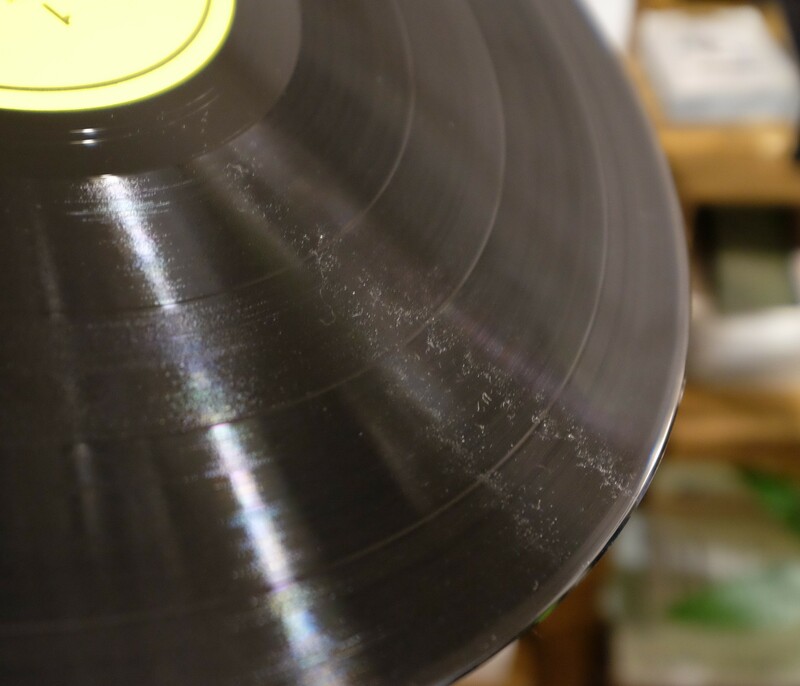 Record lovers have confronted the static dusts and struggled for a long time. Maybe at this right moment, many of them must be in the middle of this struggle. The brush quickly discharges static electricity and removes dusts at the same time. 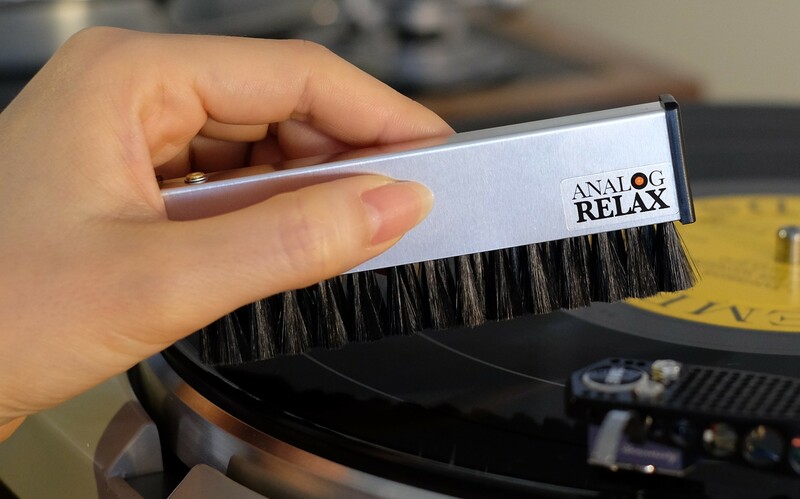 This is Analog Relax anti-static brush, created specially for vinyl discs. Annoyed at such problems as below? Usual velvet pad record cleaners generate static every time they are used, only to attract the dusts back to the record again. Cleaning sprays are also in the market, but you don’t want to put unnecessary chemical on your precious discs. Liquid cleanser is too much trouble. Wash all the record library? No way! Your record clicks and pops on the turntable due to the static especially in the dried wintertime. 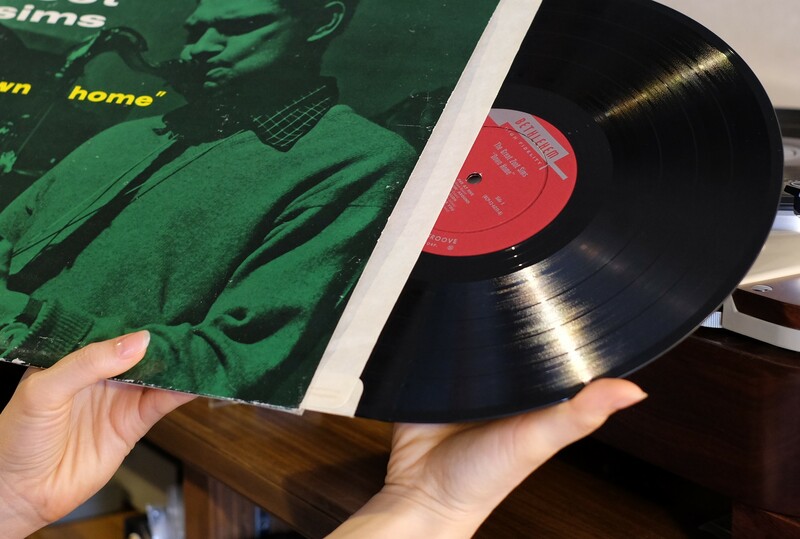 This brush clears away the irritating static dusts that disturb you every time you play the record. Static electricity is generated in various ways and mechanisms, but you see two types in using audio systems; peeling and frictional. Peeling electrification: electricity is charged on the surfaces of two objects that are touching to each other when they are pulled apart. That is the same for a record disc pulled out from the inner sleeve. Thus you generate static electricity every time you take your record out of the sleeve. The amount of charge is as high as 3,000 ~ 20,000V depending on the environment (temperature and humidity). The lower the humidity is, the higher the charge tends to be. Static charge after playing the record on the turntable. Analog Relax anti-static brush can remove 70 ~ 80% of static electricity on average though depending on the room environment and the timing of the vinyl disc production. This video from a friend shows how Analog Relax anti-static brush powerfully eliminates static charge. Check it out! The brush uses ultra-fine static elimination fibers with only 0.03mm in diameter. When the brush touches the record surface, it neutralizes the static charged on the disc in a corona discharge mechanism. The material was developed by Japanese high-tech textile manufacturer, for industrial applications, and is often used for eliminating static in clean rooms or in the process of removing dusts before painting in many electronic devices factories. Analog Relax anti-static brush is the first consumer product using this special fiber material. 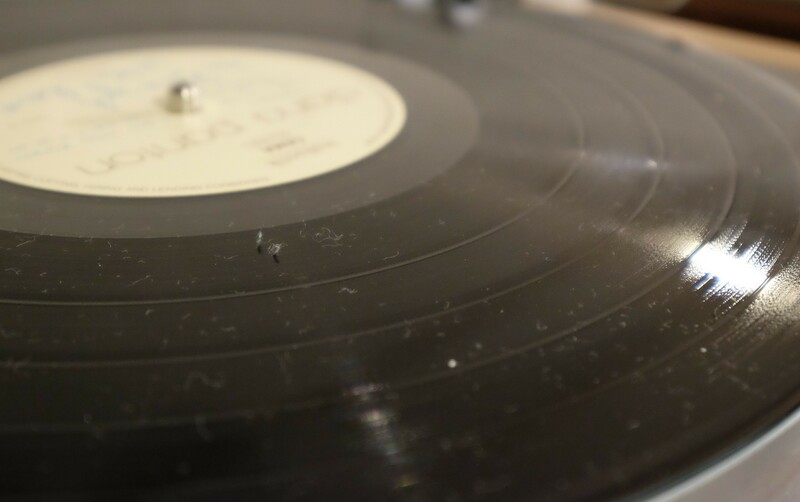 The size of a typical LP record groove is 0.05mm. The thin fiber of our anti-static brush is only 0.03mm in diameter and well capable of sweeping out the tiny dust particles in the groove. Widely-used carbon fiber brushes may look like the same, but the fibers are completely different. Here is our explanation about the difference between carbon brushes and Analog Relax anti-static brush. We made the brush ultra light for easy and comfortable brush handling on the records. Conventional anti-static brushes for audio equipment use 2 types of fibers in general. These types are highly conductive, causing troubles like a short circuit when a piece of fiber comes off the brush and gets inside the equipment. Analog Relax anti-static brush is designed to deliberately keep the conductive rate low enough to avoid short circuit even when a fiber piece comes into the audio equipment. You can check this video to use Analog Relax anti-static brush effectively. keep the brush vertical to the disc, do not hold the brush tilted. Hold the brush so that the fiber tips touch the disc vertically for higher efficiency of static elimination. Sometimes tiny dusts might cling to the surface and make a line like the pattern. In such a case you can try the way in this video. Rotate the turntable with the record on it. Hold the brush so as for the brush tip to gently touch the record surface. Slowly move the brush from the rim toward the center (the label part). Move the brush tip to push the fine dusts left on the disc along the groove toward the center label. Now your record is dust & stat free! We have received delightful comments from the customers. Analog Relax anti-static brush is optimized for record cleaning, but can be used for static elimination in various ways. For the disc surface of your CDs, DVDs, BDs. For audio equipment such as tonearms, connecting ports, etc. We created the brush for all the audio fans with great love of records so that they can enjoy stress-free sound experience in daily life. In fact, I myself am a record mania in a quest for better audio experience. And I assure you that you will be free from the annoying static dusts with this Analog Relax anti-static brush.